To create and expand a singletrack trail system in Sun Prairie. We have been working with the Sun Prairie Parks and Recreation Department, the Sun Prairie Parks and Recreation Commission, and the City Council on the development of forested, multi-user singletrack trails within the city limits. While our initial proposal for trails at Sheehan Park was denied, discussions continued and singletrack trails were developed in 2017. More details can be found here. On June 1st, 2016, during the monthly P&R Commission meeting, a proposal for another location was submitted and the group unanimously voted to support exploration and development of singletrack trails in the Smiths Crossing Community Park in Sun Prairie. In December of 2017, it was determined, from a wetlands delineation report, that there are too many wetland areas to efficiently, and economically, create a singletrack trail system in the Smith’s Crossing Community Park area. Files related to both the original Sheehan Park proposal and the Smith’s Crossing proposal can be found below. 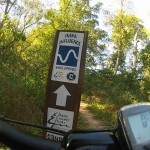 To stay up to date on this project, please refer to this section of our blog: Singletrack Trail System. We are following IMBAs Rules of the Trail as guidelines to promote responsive and courteous conduct on shared-use trails. Q. How long are these trails? A. The trail can be any length. Though the current proposed trail is about 2 miles, we won’t know the exact length until trained trail designers plot a course through the park. This process won’t happen until after the trail proposal has been approved. Q. Will the trail follow the exact lines on the proposed map? A. The current map is conceptual showing where the singletrack trail could be placed using existing areas in the park. This is not the final design. Once the trail system is approved, a professional trail designer will work with the City’s Parks and Recreation Department to lay out the final course. Q. How close are the sections of trail when they swing back around on the map? A. The switchback sections on the map appear closer than they will be in reality. Though they appear close, no two sections will be close enough for users to touch each other as they move in opposite directions. From our understanding, there are standards for how close trails sections can be and the trail design will be created with that in mind. Also, pending the terrain in any particular section of singletrack trail, the user might not even notice or see other sections of the trail unless another user is in that other section. Q. How does a singletrack trail differ from the existing paved paths in other parks? A. A singletrack trail is similar to a deer path where the animals have followed the natural terrain and vegetation to create a narrow trail through the woods. Like the deer, users of this trail will travel single file, thus the term singletrack. These natural trails utilize local dirt and sediment while typically blending into the surrounding environment. These trails also allow the user to get closer to nature without adversely affecting the vegetation or wildlife. By contract, the existing paved paths are ideal for moving larger groups through parks or allowing quicker access to distant portions of these parks. Q: What’s wrong with the existing trails? Why can’t they be used for mountain biking, running and the other activities mentioned in the proposal? A. The existing paved path system in Sun Prairie covers the needs of many, but not all users. For instance, some runners prefer dirt trails as it lessens the impact on the body when compared to pavement and blacktop. Some also prefer a changing terrain to build strength and agility while running. As to cycling, mountain biking differs from traditional road riding or “path” riding allowing the cyclist to be closer to nature, away from automobile traffic and to build skills, such as reaction time, when riding through the tight, twisting singletrack trail. Anyone can currently use the existing paths through Sun Prairie’s parks; however, as more athletic residents use these parks for training, the speed at which these users flow through the park is increasing. For instance, according to the timing details on Strava.com, some cyclists on the existing paved paths in Sheehan Park are carrying speeds over 20mph through the park. Data from Mapmyrun.com suggests numerous runners are carrying speeds over 7mph thru the park. By providing a singletrack trail system, some of this exercise could move away from heavily trafficked areas reducing speeds and the potential for impacts in these parks. Q. What skill level will be required for these trails? How aggressive with they be? A. Our intent is to build a trail system that is designed for beginner to intermediate level riders and other non-cycling trail users. We do not intend to include features that will require advanced skills or cause the user to leave the ground. Q. What about trail direction? Is there concern for users headed in opposite directions? A. We are currently proposing a unidirectional trail system which would prevent users from meeting head-on. This type of system is already in place at many of Dane County’s existing trails using non-obtrusive signage (see example below). Q. Will there be a significant change to the forested sections in the park or existing open spaces? A. Our goal is to build a low-impact trail system that follows the natural terrain and requires very little, if any, removal of vegetation. With environmentally responsible trail design and scheduled trail maintenance, there should be no long term affect to the areas used by the proposed singletrack trails. Q. Will trails in the wooded sections damage the existing trees? A. Trail building is as much about land preservation and advocacy and stewardship as it is about the silent sport of mountain biking. From removal of invasive species to keeping the land clean, people who manage and use mountain bike trails love and respect natural resources and typically have far more active involvement in the care for these resources than the general public. For more details on how mountain biking impacts the environment, please see this article from IMBA that includes scientific review and best practices: https://www.imba.com/resources/research/trail-science/environmental-impacts-mountain-biking-science-review-and-best-practices. Q. How will the trails affect the wildlife in the wooded sections of the park? Q. Will this trail system damage grassy areas of the park? Q. What other locations were considered before deciding on Smith’s Crossing Community Park? A. Numerous locations in and around Sun Prairie were considered. Some areas were designated wetlands and not usable. Others were deed restricted to foot traffic only and other spaces had limited availability due to future residential and commercial expansion. Also, Dane county is currently focused on commuter specific trails so this was not an option for their support and Sheehan Park was already turned down due to it already being over user capacity. Considering the existing multi-use parks in Sun Prairie, Smith’s Crossing Community Park includes wooded areas where singletrack trails could be built, provided quick after school access for the high school and middle school mountain bike teams and physical education programs, includes parking so that trail users don’t impact local residents and is nearby existing multi-user paths. Smith’s Crossing Community Park, being an existing multi-user park, also provides ample recreational activities for family and friends of the trail users meaning that families, Scouting programs and others can use both the new singletrack trail system and the plethora of other recreational activities at the same time. Q. How will the use of this singletrack trail affect events when they are held in Smith’s Crossing Community Park? A. The use of this singletrack trail system will be the same as the use of the current paved paths and grass areas when it comes to scheduled events. Our understanding is that event promoters in Sun Prairie parks provide ‘marshals’ to warn other park users at critical junctures and post signs around the park. Those same efforts can be made regarding the singletrack trail during events. Plus, the singletrack trails will stick mostly to the forested areas which are not currently being used for other events in the park. Q. What hours will the trails be open? Will they be open 24 hours, during park hours, other? A. The singletrack trails will be part of Smith’s Crossing Community Park and thus subject to park hours. Current hours end at 10pm. Q. How will the use of these trails affect noise near homes? A. The use of these singletrack trails should have little to no effect on those living near the park. When designing trails, the professional trail designers take into account their proximity to residential property, work within the forested sections which provide natural noise suppression and we are not designing gathering places along the trail. Plus, more eyes and ears on the trail in these sections results in less places for people to hide illicit and illegal activities and thus less potential for people attempting to access nearby homes through the woods. Q. What about liability for events at the park? A. Use of the park is already covered under a recreational immunity act. There is also discussion of signage that will mention assumption of personal risk for the user as well as suggesting the use of safety equipment. Q. What about potential incidents with users of other sections of the park, such as other cyclists, runners, pedestrians, etc? Trail signage warning singletrack trail users of an oncoming traffic intersection and asking them to yield to other users. Designing the singletrack trail so that it parallels open areas before entering allowing trail users to see other park users. Designing the singletrack trail to include extra turns that slow down users before entering open areas. Reducing excess vegetation to improve sight line visibility. As to interaction on the trail, due to the nature of the twisting trails, the speed of the user will be low allowing them time to stop if they notice other users. In areas where the trail is straighter and speeds might be higher, visibility on the trail will allow the users to see each other in time to prevent a collision. Also, the wilderness in these sections are fairly short and/or narrow and won’t hide other users like buildings might on city bike paths.